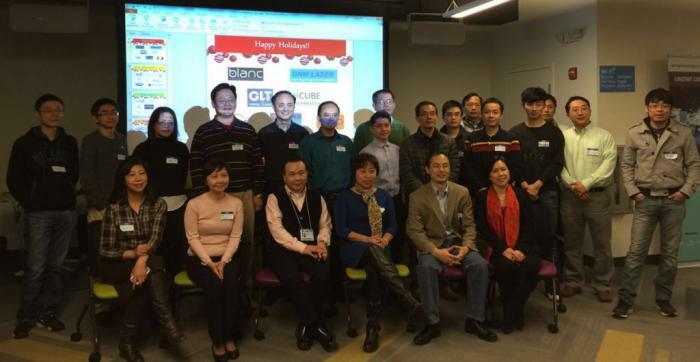 E Club and NEW celebrated the holidays in entrepreneurial spirit at ConstantContact Innoloft on December 13, 2014. We had holiday snacks, fun games and raffle draw with prizes donated by E Club members GNW Laser, CEC Business Solutions, Suzhou Chem and Boston Web Power. NEW teams presented their businesses. Shown below are the Electric Spring team explaining how their battery and capacitor combo can help Santa power his vehicle, and the Tech-No-Logic team demonstrating how their innovative Magic Wok cooks vegetable fried rice according to a stored recipe. Eddy Zhong, co-founder of Blanc, presented their product, Spark, a watch that keeps you awake. Blanc received funding from kickstarter and is now selling at wearblanc.com. Spark is also featured in Skymall. Eddy completed NECINA’s YES and NEW programs and is now an E Club member. Way to go! As always, we took a group photo. Happy Holidays, everyone!